Reports indicate health information exchanges are making serious inroads toward delivering on their intended goals. During the past two years, health information exchanges (HIEs) have experienced rapid transformation. For the surviving initiatives, the most significant changes revolved around achieving sustainability and expanding functionality to meet the evolving needs of stakeholders and communities, leading to successes that created a domino effect within the HIE environment. Many of the most notable advances are detailed in the results of the eHealth Initiative’s (eHI) 2010 Annual Survey of Health Information Exchange. Notably, the survey found that the number of operational exchanges increased from 57 in 2009 to 73 in 2010. Also significant was the number of initiatives that could be considered sustainable, including 107 that were not dependent on federal funding and 18 that broke even through operational revenue alone. Participants also reported increases in the functionality offered through the HIE with respect to meaningful use. The top three were connectivity to EHRs (67), results delivery (50), and health summaries for continuity of care (49). The top five types of data exchanged by the initiatives were laboratory results (68), medication data (63), outpatient laboratory results (62), allergy information (61), and emergency department episodes/discharge summaries (58). Covich notes that new initiatives continue to make some of the same mistakes as their predecessors—mistakes that can impede their ability to achieve viability and sustainability. Emerging HIEs are fortunate in that they do not have to go it alone in their quest for success. They can follow the path blazed by the pioneering initiatives that defied the odds to not only survive but thrive—a path paved with 10 elements necessary for a solid foundation. Whether the initiative in question is a small local HIE or a multicounty regional exchange, gaining and maintaining comprehensive stakeholder engagement is imperative for long-term stability and, eventually, sustainability. That includes stakeholders that may not be active or initial participants in the exchange but will nonetheless benefit from its success. Comprehensive stakeholder representation and engagement ensures that an HIE will offer the functionality necessary to meet community expectations right out of the gate. It also helps eliminate the competitive obstacles that have been the death of many initiatives. Successful HIEs are characterized by a high level of trust between an HIE and its stakeholders and among the stakeholders themselves. In particular, gaining provider and consumer trust can often be the most significant challenge but one that is imperative to overcome. Furthermore, initiatives that are not successful at establishing trust in their security and use policies will have no data to share. No data means no value. A clear and compelling vision and the ability to articulate the value it will bring to stakeholders and the community at large is credited with the survival of some of the longest-standing HIEs. That ability to convey what the HIE will do and why, in a manner that is easily understood by multiple audiences, is the first step on the path to the long-term engagement and the support necessary to achieve sustainability. “The most important thing is that you articulate a compelling vision. The people who have been hanging in for all these years have been able to describe where they want to go and inspire with the big picture. In addition to a compelling vision, you also need a map of how to get from here to there so it doesn’t just feel like you’re spinning your wheels,” says Laura Adams, president and CEO of the Rhode Island Quality Institute (RIQI) and chair of the NeHC 2010 board of directors. This includes clearly defining a strategy for secondary use of data, which is where much of the long-term value is derived. For example, clinical data gathered by an HIE initiative can be used for public health surveillance, medical research, quality improvement, and detecting fraud, waste, and abuse. 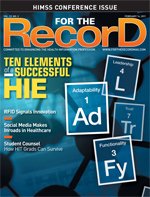 “Smart HIEs plan early on to integrate deidentification and aggregation of personal health information for secondary use so it can be used to significantly improve the cost and quality of healthcare within their jurisdiction; it can also be an important revenue stream for the HIE,” says Craig Miller, vice president for health innovation and strategy with Vangent. As little as two years ago, most HIEs focused on delivering one or two functions that stakeholders identified as delivering the greatest value, such as the exchange of test results or e-prescribing. Rarely were HIEs multifunctional. That is no longer the case, thanks in large part to technology advances and the track record of success more mature HIEs have established. If established HIEs have learned one lesson, it is that change is constant. Whether it’s shifting stakeholder or community needs and expectations, conditions placed on funding, unexpected new opportunities, or simply rapid expansion of participants, success requires flexibility. “Even mature initiatives are still adding functionality and providers, so it’s always growing and changing. There are new challenges and new issues cropping up all the time. Most of them are political rather than technical, but it’s very real stuff … so you have to be prepared for it,” says Miller. Adams points to RIQI’s recent $15.9 million grant from the Beacon Communities program, receipt of a federal HIE grant, and regional extension center designation as developments that required the nine-year-old HIE to make a number of unanticipated adjustments to its business plan. That ability to adapt to unexpected changes also applies to the technology an HIE ultimately deploys. Too often, the technical infrastructure is incapable of expanding with an initiative’s needs or changes to certification requirements or standards. When that happens, an HIE cannot function with the agility necessary to survive in a rapidly evolving healthcare environment. It is also important that the technology be able to accommodate the highest levels of security and authentication, both within an HIE’s own platform and when integrated with participating systems. Finally, HIEs need to look beyond “traditional” technologies such as EHRs, which are not sufficient on their own to deliver full functionality. Also needed are master patient indices, provider directories, enterprise document registries and repositories, audit logging, and policy engines to automate disclosure decisions. “All of these tools require configuration and data population, and the cost and effort of this is often underestimated in HIE planning activities,” says Miller. Particularly at start-up, successful HIEs keep a close eye on the bottom line by finding innovative ways to minimize the costs associated with developing the initial infrastructure. While this primarily relates to technical architectures, it also applies to existing administrative processes that can be leveraged to keep initial costs low. Even when everything is done correctly from the outset, progress within an HIE happens slowly enough to discourage even the most ardent supporter. That is why the most effective initiatives are proactive about tooting their horns when even the smallest milestones are passed. Running an HIE requires a leader who is strong enough to steer competing factions toward consensus on everything from what functions are required and how data will be exchanged and controlled to who will participate in the various stages of growth. HIE leadership must also be able to act as cheerleader, fund-raiser, IT guru, and government liaison. It is rare to find one individual with all the necessary skills and qualities. The best initiatives find that one person who possesses the most and hires experts to fill gaps. “Don’t underestimate the strength required of the leadership involved in this. Be sure you get someone with extraordinary strength … and then work hard to retain those leaders. Along with strength, continuity is important,” Adams notes. Success requires appropriately managed expectations. The HIE road is far from easy, making it important that leadership and stakeholders are aware of the level of commitment from the outset. Overpromising is an easy trap to fall into when it results in a high level of early support, but it can be fatal when expectations are not met and that support is pulled.